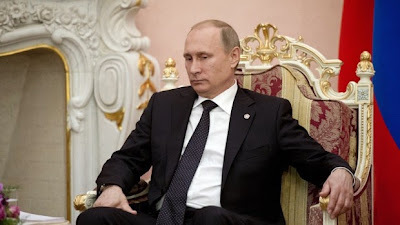 MOSCOW, Russia -- Russia's toxicity for investors is suddenly so 2014. Western money is returning to Moscow's equity and bond markets, and private Russian companies are again able to borrow, albeit at a premium to Western peers. The main cause for this reversal of fortunes is the cease-fire in Ukraine, even though it isn't really holding militarily or moving forward politically. That's a paradox that may shed light on how events in eastern Ukraine will develop. The Wall Street Journal reported Wednesday that "investors have taken Russia out of the penalty box." According to the global fund tracker EPFR, the influx of cash into mutual and exchange-traded funds targeting Russian securities so far this year has almost wiped out last year's outflow. This can be explained in economic terms. The ruble is the best-performing major currency so far this year, having gained 14 percent against the U.S. dollar. That's mainly because the oil price, all-important for Russia's fiscal health, has stabilized at a higher level than doomsday prophets predicted -- above $60 a barrel of Brent crude. And Russian economic data, while hardly encouraging, don't indicate an impending collapse. So why not give Russia a chance, especially since it promises higher yields than most other big markets? International lenders led by Societe Generale, ING and Natixis have just provided $530 million to Uralkali, Russia's world leader in potash production, at 3.3 percentage points above the Libor benchmark rate. European companies with similar credit ratings pay less than half that premium now. This reasoning, however, works only because the fighting in Ukraine slowed after the signing of the Minsk cease-fire in February. A continuing all-out war would have made the risk of further international sanctions on Russia unbearable for most investors. The Western sanctions against Russia didn't inflict much economic damage, because when they rendered big Russian state companies unable to borrow in Western markets, the government stepped in to help them. Yet, for some time last year, the sanctions did succeed in scaring investors away. That was a mainly psychological effect, which is now wearing off thanks to the truce. The cease-fire in eastern Ukraine probably won't be implemented fully. Although the large-scale warfare has stopped and some heavy weaponry has been pulled back from the lines of separation, there's still localized fighting. Moreover, observers from the Organization for Security and Cooperation in Europe, empowered to monitor truce observance, still have limited access to areas held by pro-Russian separatists. A more stable peace could have been expected this long after the deal was signed, if the pro-Russian side were truly interested in ending hostilities. Ukraine, at the same time, has been unwilling to grant more autonomy to rebel-held regions, as prescribed by the Minsk deal, until local elections are held there in accordance with Ukrainian law. There won't be any elections until the rebel commanders -- and their masters in Moscow -- are satisfied with their new powers. In this situation, even the U.S. is only talking about maintaining, rather than expanding sanctions, because Americans know that without another major Russian offensive to react against they'd have a hard time convincing Europe to go along. It makes sense for Russian President Vladimir Putin to find this kind of equilibrium, allowing his country's investment rebound to gain momentum, while keeping Ukraine on the hook. That implies a frozen conflict scenario, in which there is no war and no deal, a situation that could be maintained more or less indefinitely -- as Transnistria, the unrecognized state in limbo between Ukraine and Moldova since the early 1990s, shows. Keeping the conflict unresolved may hinder Ukraine's integration with Europe and the North Atlantic Treaty Organization. This kind of stasis is less acceptable for Ukraine, for the same reasons, but the government is Kiev is stuck. It can't make a military move to reclaim its territory, because it can't risk another defeat. President Petro Poroshenko will probably end up tacitly agreeing to freeze the conflict for now, because Ukraine also stands to benefit from the psychological effect that a relative peace would have on investment. And right now, Ukraine needs market confidence much more than it needs rebel-held Donetsk.